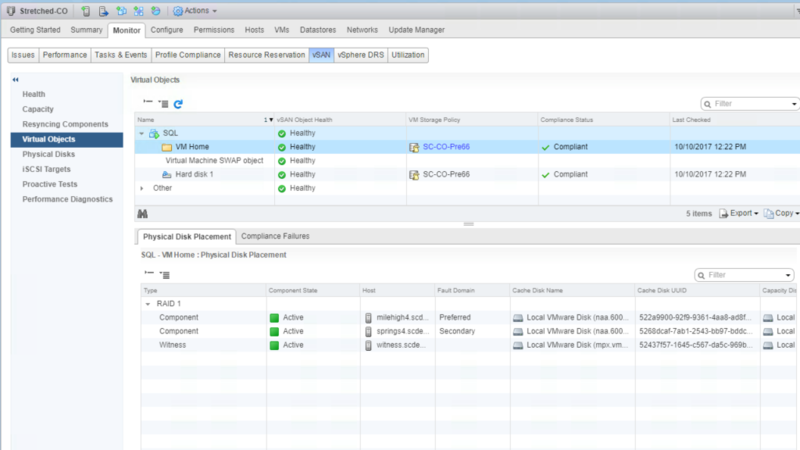 Here’s what the placement of a VM Home looks like: One component is in the Preferred site, one is in the Secondary site, and then there is a Witness component on the vSAN Witness Host. Looking at the Swap file, it is also the same. One replica in each site, and a Witness component on the Witness host. I’ve covered this before specific to the fact that VM SWAP objects are configured with an Object Space Reservation of 100%. We introduced the Sparse Swap setting in 6.2 back in March of 2016. Going a bit deeper than the Object Space Reservation rule, VM SWAP objects are always mirrored (FTM=Mirroring) and adhere to traditional Fault Domain placement rules. 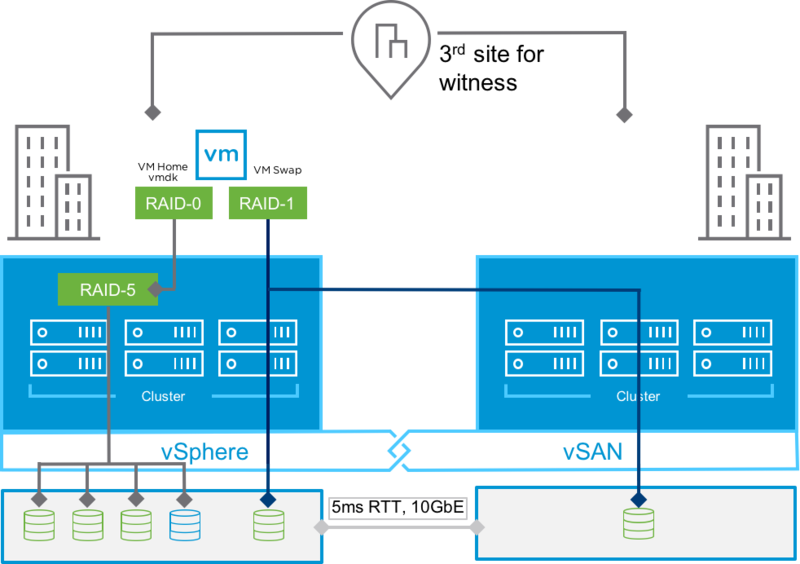 Put simply: Regarding vSAN Stretched Clusters, VM SWAP objects will always have one replica in each site, and a Witness component residing on the vSAN Witness Host. When using a SPBM Policy that supports traditional protection (across sites) as well as Local Protection , the VM objects (VM Home/vmdks/etc) will be mirrored across sites, but will be either mirrored or erasure coded (depending on policy) within the Preferred and Secondary site. Whatever SFTT+FTM is set to, both sites must be capable of satisto be in compliance. There is a Witness component on each site (part of the Secondary Failures To Tolerate rule) and one on the Witness Host. 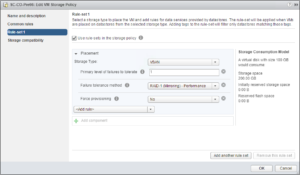 When using a SPBM Policy that provides local protection only, the VM objects (VM Home/vmdks/etc) will be either mirrored or erasure coded (depending on policy) within the Preferred or Secondary site. This is an or situation, because the Affinity rule will determine whether the VM’s data resides in one site or the other. Notice that the only Fault Domain listed is the Preferred Fault Domain. But what about the VM SWAP Object when using vSAN 6.6 with either Local Protection or Site Affinity? Good question. 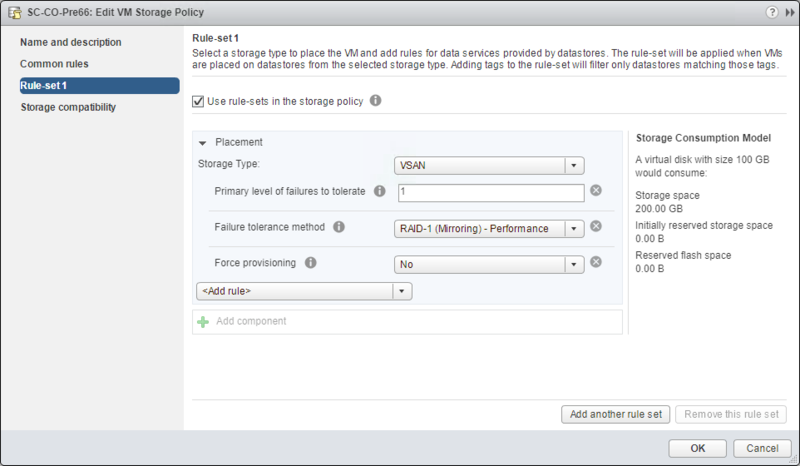 Remember that the VM SWAP Object doesn’t have a policy applied. It is hard coded. 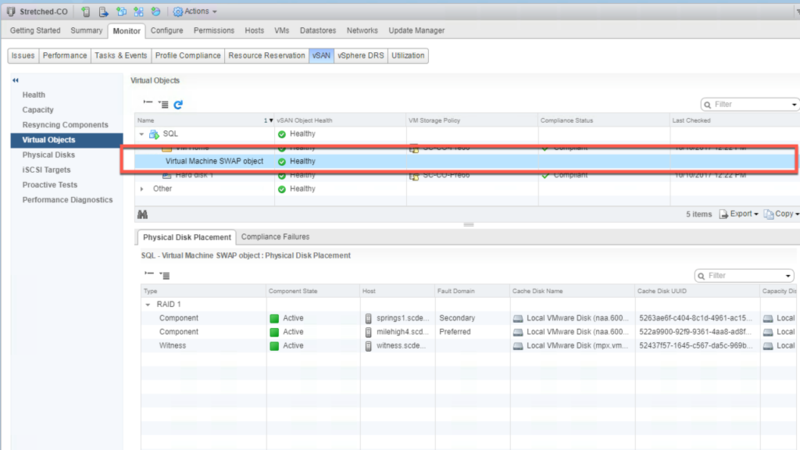 Looking at the VM with the Site Affinity policy applied, what is expected from the VM SWAP Object? That’s right, the VM SWAP Object still lives on both the Preferred and Secondary sites. Regardless of vSAN version (6.1-6.6), VM SWAP Objects will still be written across sites when using Stretched Clusters. This is because the VM SWAP Object has a hardcoded policy. 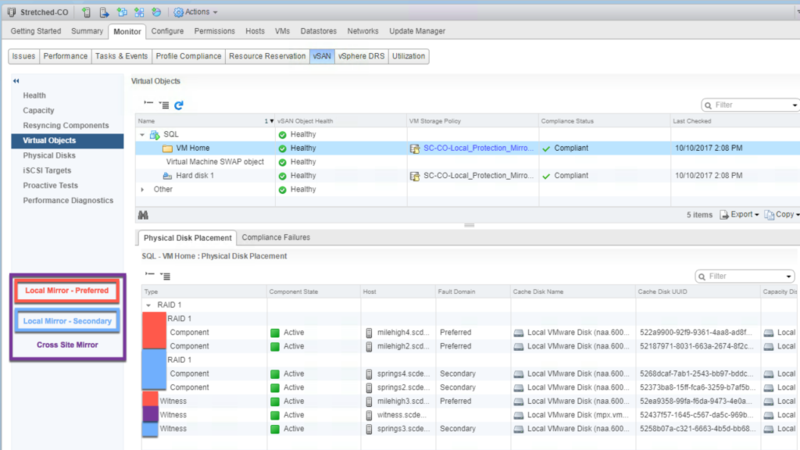 Next PostHow long does it take to… Enable vSAN Encryption?